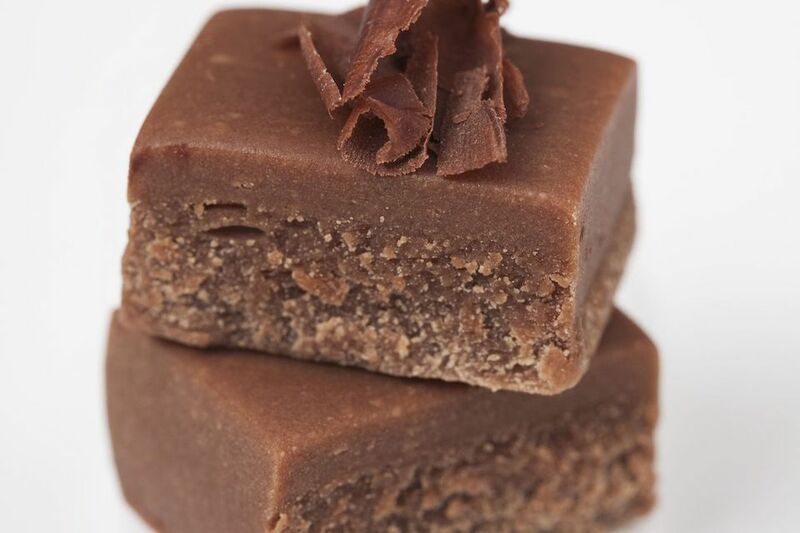 Dark Chocolate Nougat is a soft, fluffy nougat with a deep chocolate taste. It makes an amazing candy bar filling and can be enjoyed plain, or with the addition of your favorite toasted nuts or chopped dried fruit. As with many egg white-based candies, nougat does not do well in humidity, so try to choose a low humidity day to make this candy. Because this nougat is wonderfully soft at room temperature, it's not ideal for serving without a chocolate coating. Instructions for the optional chocolate dipping are included at the bottom of the recipe. Prepare a 9x9-inch pan by lining it with foil and spraying the foil with nonstick cooking spray. For thinner nougat, a 9x13 pan can be used. Melt the chocolate in the microwave, stirring after every 30 seconds to prevent overheating. Once melted, set aside to cool to room temperature. Place the egg whites and salt in the bowl of a large stand mixer that has been thoroughly cleaned and dried. Any traces of grease on the bowl or whisk will prevent the egg whites from beating properly. Combine the corn syrup, sugar and water in a large saucepan over medium heat. Stir until the sugar dissolves, then brush down the sides of the pan with a wet pastry brush to remove any stray sugar crystals. Insert a candy thermometer, and cook the syrup, without stirring, until the mixture reaches 230 degrees Fahrenheit (110 C). When the syrup reaches 230 F, start beating the egg whites with the large mixer using the whisk attachment. Beat until the whites form stiff peaks. Ideally, this stage should be reached when the sugar syrup reaches 240 F (116 C), but if the whites are at stiff peaks before the syrup is ready, stop the mixer so the whites are not overbeaten. Replace the whisk attachment with the paddle attachment. When the mixture reaches 240 degrees F (116 C), remove the pan from the burner and carefully pour about 3/4 cup of hot syrup into a large measuring cup. Return the pan to the heat to allow it to continue cooking. Turn the mixer speed to low, and slowly and carefully stream the 3/4 cup of hot syrup into the egg whites. Let the eggs continue beating on medium-low speed while the syrup cooks. Cook the syrup until it reaches 280 F (138 C). Pour the remaining syrup into a large mixing cup with a spout—this makes it much easier and safer to pour. With the mixer running, slowly stream in the remaining hot sugar syrup. Be very careful that you don’t get any on yourself—it can leave a nasty burn. Once the sugar is thoroughly mixed in, turn the mixer off. Pour in the melted chocolate and vanilla extract, and stir with a rubber spatula until well-mixed. If you're adding nuts or dried fruit, add them last and stir until well-incorporated. The candy will be sticky and stiff. Scrape the candy into the prepared pan. Allow to set for several hours at room temperature. This candy remains soft and fluffy at room temperature, so for the cleanest cuts, refrigerate it until firm before cutting it with a large sharp chef's knife. If it gets too sticky, wash the knife with hot water in between cuts. Melt the chocolate candy coating in the microwave, stirring after every 30 seconds. Cut the chilled nougat into small squares or bars. Line your work surface with waxed paper or parchment paper. Use a metal spatula to spread a thin layer of coating on the bottom of every bar, then put the bar, coating-side down, on the work surface to set. This bottom layer of chocolate will give the nougat some stability when you dip it. Once set, submerge a bar in the coating and use dipping tools to pull it out. Let excess drip back into the bowl, drag the bottom of the bar against the lip of the bowl, then place the bar back on the waxed paper to set completely. Once set, the bars can be stored and served at room temperature.